Wood is even today one of the most important raw materials. The processing of wood, however, has changed considerably - from farm or manual processing to ultra-modern industrial products. The knowledge about wood selection, storage, processing etc. has traditionally been passed on from generation to generation. Only in exceptional cases written records are available. During the 14th century special crafts were developed. But here, too, the oral transition of knowledge prevailed. The existing publications often do not provide the necessary details to understand the working steps or why a specific type of wood has been used for a certain purpose. 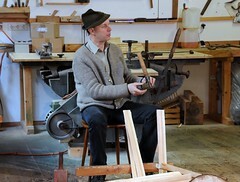 The goal of the project is a complete documentation of selected woodworking techniques. This requires new concepts of film production, which are developed jointly according to a strongly participatory approach of pupils and scientists. For example, head cameras, 360 ° video and virtual reality content can be used to follow the work steps optimally. Each concept is discussed in advance with the craftsmen and scientists (wood research, folklore, media technology). Before the film shootings it has to be determined, what the "key scenes" are and how to document them best. The films are meant to enable people with handicraft skills to imitate these techniques. The pupils will be introduced to the selected crafts during the preparation and will be actively filming and cutting. On the one hand, detailed film documentaries will be developed and, on the other hand, a modern dissemination will be carried out in order to inspire people for woodworking crafts. These films must therefore be available online, on a mobile basis and adaptable for young people. Only in this way it will be possible to motivate young people for crafts in general and to enable easy access. The pupils are very important for the development process, as they will have a significant influence on this design step because of their user knowledge.